The latest release of Microsoft's on-premises customer relationship management (CRM) product, Dynamics CRM 2013, reached general availability on Thursday. Partner-hosted versions of Dynamics CRM 2013 are also now available. The Microsoft-hosted version of the product, Dynamics CRM Online Fall '13, was rolled out to new and current users worldwide in early October. According to a Microsoft spokesperson, while Dynamics CRM 2013 is technically available to purchase now, Microsoft's official product launch is not until Monday, one day before the start of Microsoft's Convergence EMEA conference. The "Dynamics CRM Global Premiere Event" will be webcast live on Nov. 4 from Barcelona, Spain, beginning 8:30 a.m. PST. The launch event will feature live demos of Dynamics CRM 2013. 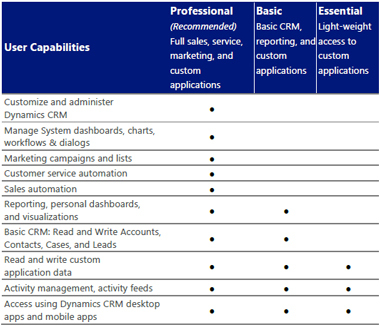 Touch-optimized Dynamics CRM apps for the Apple iPad and Windows-based tablet devices are already available. Microsoft has previously said that it plans to deliver smartphone apps for Android, iOS and Windows Phone devices within a month after Dynamics CRM 2013's general availability date. In addition to the added mobile device support, changes to Dynamics CRM 2013 include a revamped and more graphical user interface; closer integration with Microsoft's Lync, Skype, Yammer and MarketingPilot technologies; and, for Dynamics CRM Online, a new real-time data-gathering feature called "Social Insights" that was developed as part of a collaboration between Microsoft and San Francisco-based Dynamics partner InsideView. Microsoft revamped its licensing scheme for Dynamics CRM 2013 so that the hosted version and on-premises version have parity with each other. The hosted version now has a three-tiered User Subscription License (USL) model that parallels the three-tiered Client Access License (CAL) model of the on-premises version. The new licensing scheme lets organizations "license the solution based on how their users use Dynamics CRM functionality, and mix-and-match these licenses within a deployment," according to Microsoft documentation. Microsoft provides reference PDFs for Dynamics CRM 2013 licensing here (for the on-premises version) and here (for the hosted version). Microsoft plans to release a tool later this year to help organizations calculate each Dynamics CRM user's licensing usage, and then adjust their licensing plans accordingly, according to this post on Microsoft's Dynamics CRM blog.